Rethinking Parking Requirement Exemptions with Spontaneous Accessibility proposes Spontaneous Accessibility as a mechanism for determining when developers of new residential or commercial sites in Seattle should be exempted from providing parking. Currently this decision is made by evaluating access to frequent transit using a distance and headway-based process. Replacing this process with Spontaneous Accessibility measurements incorporates additional precision and nuance, better determining whether new parking-exempted sites are truly served by transit that can meet the entirety of resident needs. 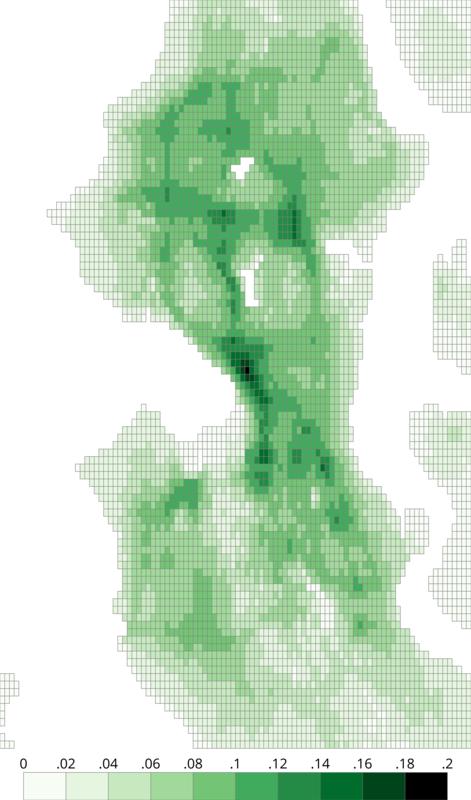 Though focused on a single problem in Seattle, it provides a framework for using Network Accessibility and Point Accessibility to solve land use problems generally. Two months ago, Public Transit Analytics described Network Utility as a measurement that could quantify how useful a transit network is. However, computing this measurement in practice was difficult: calculating it for a reasonably detailed map of Seattle would take an infeasible amount of time. While Cumulative Point Utility was proposed as a method for simplifying the calculation, the parameters of using it practically were unclear. Unfortunately the desired clarity remained elusive. At the same time it became obvious that the utility measurements on the whole failed to communicate their purpose to transit planners. These two setbacks necessitated a challenging rethinking of these measurements, both in their terminology and calculation. Until now, Public Transit Analytics proposed that how "useful" or the "utility" of a transit network was what its measurements quantified. Unfortunately these terms are both overly broad and fundamentally miscast in describing those measurements. "Utility" has a specific meaning in economics, which sometimes finds its way into transit planning literature. Meanwhile, there was an understandable resistance to using a term as general as "useful" to solely express the ability of individuals to reach destinations regardless of the time of day or the differing value of locations. Reviewing the literature of academic transit planning was critical to properly name these measurements, giving them precision and clarity. Fundamentally, Public Transit Analytics's measurements quantify accessibility, which, broadly, is the ability of individuals to reach opportunities. Studies of accessibility are a perennial topic in peer-reviewed transit planning literature. Many of these studies use measurements that resemble what this blog described as Point Utility or Network Utility. However, these studies have often focused on a specific type of opportunity, such as access to jobs during the morning rush hour or how easily certain shopping centers can be reached by transit. In contrast, Public Transit Analytics's measurements have worked towards greater generality: focusing on the ability to start in arbitrary locations and reach arbitrary destinations, at arbitrary times of day. In considering this contrast, it's clear that both Public Transit Analytics and other researchers are measuring some way in which the transit network is useful. Other researchers have largely focused on transit trips that are preexisting or expected. On the other hand, Public Transit Analytics is measuring the ability to take unanticipated, unexpected trips. These trips may occur any time of day, with unpredictable origin and destination points. In other words, the measurements describe the ability of the network to support spontaneous transit trips, and therefore the measurements that once quantified utility now describe Spontaneous Accessibility. Building a transit network that excels at allowing these trips is difficult, given the limitations that transit service has in contrast to private vehicle ownership. By ensuring that new projects and restructures incrementally improve Spontaneous Accessibility, individuals can increasingly count on transit to meet all of their needs. Furthermore, the literature review made it clear that accessibility-based measurements represent only a subset of the ways of quantifying the value of a transit network. Primarily, many agencies use a four step forecasting model to predict the ridership or total time saved of proposed modifications to transit networks. This blog formerly expressed some skepticism of such methods. After a careful examination of the literature, Spontaneous Accessibility measurements are more a complement than a replacement. When modifying a transit network, understanding its impact to existing riders and their anticipated trips is important. At the same time, improving Spontaneous Accessibility has value in attracting new transit trips, discouraging car ownership by making spontaneous trips on transit more achievable, and improving service for those who solely rely on transit. This recasting of Spontaneous Accessibility would be for naught if it could not be calculated in a network-wide, all-day way feasibly. Unfortunately, the approach of using mutual information calculations to establish a threshold for using Cumulative Point Utility yielded inconsistent results. Consequently, Public Transit Analytics did not just rename Network Utility to Network Accessibility, but made its calculation faster. By rewriting its destination-finding algorithm to use dynamic programming and eliminating the consideration of Sectors that are entirely on water, the time to calculate Network Accessibility has been improved by multiple orders of magnitude. While now computationally feasible, it is still expensive. It's possible, though, to make a measurement of the current transit network using Network Accessibility, wherein every Sector center and minute of the day is used. For subsequent transit planning experiments, a sample of these starting points can be selected. The sample's closeness to the full Network Accessibility can be tested using a different information theoretic technique: Kullback-Leibler divergence. Once a sufficiently close sample is found, a Sampled Network Accessibility of the experiment can be compared to the original Network Accessibility. The research that went into confronting these two issues yielded a very favorable outcome: Public Transit Analytics submitted a paper to the Transportation Research Board describing Spontaneous Accessibility and analyzing its change in Seattle over a year period. If accepted, it will be presented or published in January of 2018. The following map from the paper shows Spontaneous Accessibility in Seattle on January 25, 2016, before the opening of the Link light rail extension through Capitol Hill and the University of Washington. Each Sector is colored based on the proportion of origin location and time pairs that allow the Sector to be reached within 30 minutes. Averaging these proportions results in the Network Accessibility Ratio, which eschews the scaling factor that Network Utility used. In this case, the Network Accessibility Ratio is 0.06017. Currently, the map is only available in a non-interactive form, though improved interactive versions are in the works. With the ability to compute Network Accessibility now possible, this blog will begin to primarily focus on using it to measure hypothetical transit network changes. In lieu of completing the Foundations of Evaluating Public Transit Networks series, a technical brief describing transit planning using Spontaneous Accessibility measurements will be published shortly.